How are you all? I know that I have not written a personal post for a long time. Hey! I apologize. I have been very busy for my writing project this year - the novel - and so engrossed with community projects that are mostly church-related. Two months ago, I had wonderful experiences while attending a camping activity. I'm one of the youth leaders so I helped organized it. 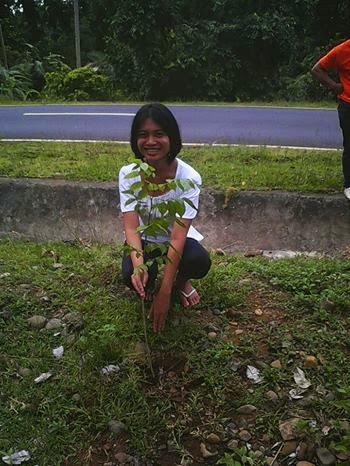 It was a fulfilling task but I'm really interested with the tree planting project that was inserted in the itinerary. For an hour, we completed the task. We planted different seedlings of popular trees in this tropical country. The government staff of the place that we used for the three-day camping activity was happy because of the successful activity that is part of their environmental protection program. I'd like to share a photo of the activity. Obviously, I don't like an off duty look but I have to pull it off for the task. I choose black and white theme because I would like to play it cool.